Handfasting is a rural folkloric and neopagan custom, initially found in western European countries, in which a couple hold a commitment ceremony. The commitment may be seen as temporary and secular, or of a longer, spiritual variety, depending on the context. Handfasting is a history term for "betrothal" or "wedding". In the Early Modern history of Scotland (16th and 17th centuries), especially in the Hebrides, the term could also refer to a temporary marriage. The verb to handfast in the sense of "to formally promise, to make a contract" is recorded for Late Old English, especially in the context of a contract of marriage. The derived handfasting is for a ceremony of engagement or betrothal is recorded in Early Modern English. The term was presumably loaned into English from Old Norse handfesta "to strike a bargain by joining hands"; there are also comparanda from the Ingvaeonic languages: Old Frisian hondfestinge and Middle Low German hantvestinge. The term is derived from the verb to handfast, used in Middle to Early Modern English for the making of a contract. The term "handfasting" or "hand-fasting" has been in use in Celtic neopaganism and Wicca for wedding ceremonies from at least the late 1960s, apparently first used in print by Hans Holzer. Handfasting was mentioned in the 1980 Jim Morrison biography No One Here Gets Out Alive and again in the 1991 film The Doors, where a version of the real 1970 handfasting ceremony of Morrison and Patricia Kennealy-Morrison was depicted (with the real Patricia Kennealy-Morrison playing the Celtic Pagan priestess). Civil wedding ceremony in Ukraine. The cloth is a ceremonial rushnyk decorated with traditional Ukrainian embroidery. The term has entered the English-speaking mainstream, most likely from neopagan wedding ceremonies during the early 2000s, often erroneously being described as "pre-Christian" by wedding planners. 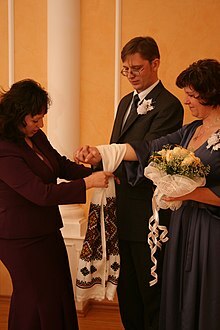 Evidence that the term "handfasting" had been re-interpreted as describing this ceremony specifically is found in the later 2000s, e.g. "handfasting—the blessed marriage rite in which the hands of you and your beloved are wrapped in ribbon as you 'tie the knot.'" By the 2010s, "handfasting ceremonies" were on offer by commercial wedding organizers and had mostly lost their neopagan association (apart from occasional claims that attributes the ceremony to the "ancient Celts"). 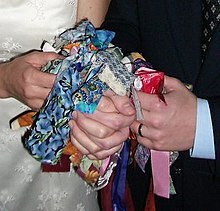 The term "handfasting ribbon" appears from about 2005. ^ "handfasting, n." and "handfast, v." OED Online. November 2010. Oxford University Press. "Old Norse hand-festa to strike a bargain by joining hands, to pledge, betroth" The earliest cited English use in connection with marital status is from a manuscript of c. 1200, when Mary is described as "handfast (to) a good man called Joseph". "?c1200 Ormulum (Burchfield transcript) l. 2389 "Ȝho wass hanndfesst an god mann Þatt iosæp wass ȝehatenn." ^ "My wife and I were married by the handfasting ceremony, and it was most controversial." - Hans Holzer, The Truth about Witchcraft (1969), p. 172; "Then I learned that the "special meeting" was, in effect, a wedding ceremony called "hand-fasting" in Wicca." Hans Holzer, Heather: confessions of a witch, Mason & Lipscomb, 1975, p. 101. ^ a b Kennealy, Patricia (1992). Strange Days: My Life With And Without Jim Morrison. New York: Dutton/Penguin. p. 63. ISBN 0-525-93419-7. ^ cover blurb of Kendra Vaughan Hovey, Passages Handfasting: A Pagan Guide to Commitment Rituals, Adams Media, 2007. ^ Wendy Haynes, "Handfasting Ceremonies" (wendyhaynes.com), January 2010: " It was used to acknowledge the beginning of a trial period of a year and a day during which time a couple were literally bound together - hand fasted." ^ Handfasting ribbon, finished (wormspit.com) 4 July 2005; Jacquelyn Frank, Jacob: The Nightwalkers, Zebra Books, 2006, p. 320.